For decades, it was widely assumed that the brightest Indians would go overseas to study and eventually settle there. Today, signs have begun to appear that the tide may be turning. The fact that global companies are setting up operations in India makes it easier for non-resident Indians to return home, often while remaining with the same employer. Indian students are not leaving the country as eagerly as they once did, and if they do, they go back home much faster because of the attractive professional opportunities there. Others return because they feel they are losing a connection with their past. 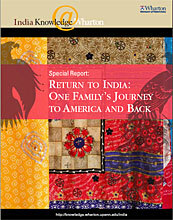 In this special section, India Knowledge@Wharton offers one family’s experience as a microcosm of the larger trend — Bangalore-based writer Shoba Narayan’s account of her family’s decision to return to India, after living in the U.S. for 20 years.